The Core Team just returned from a great long weekend in the Finger Lakes; the fun we have actually makes the four hours in transit each way worthwhile. 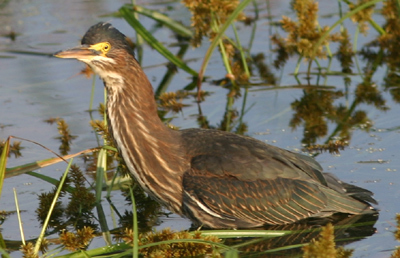 It also helps that Lake Skaneateles is just a stone’s throw away from the magnificent Montezuma National Wildlife Refuge. Seth and I try to drop in at least once a year, and though we kicked the New Year off here with a bang (or a trumpet) we haven’t given up on spotting Sandhill Cranes here. This refuge and the greater Montezuma Wetlands Complex shelter all manner of amazing birds during the summer, from cranes to Black Terns to legions of shorebirds. Unfortunately, although Corey spotted most of my target Montezuma birds just a few weeks ago, Seth and I came up empty. No soras, no bitterns, no rails, and certainly no cranes! In fact, we even visited the Knox-Marcellus Marsh , where phalaropes and uncommon sandpipers have been turning up daily; we walked away with little more than a pair of distant dowitchers. However, our visit could hardly be classified as a bust. Montezuma makes for amazing birding no matter what the conditions. Right now, the Main Pool on the Wildlife Drive is drained as part of an initiative to stimulate the natural drought cycle. The iconic acres of wetlands that greet most visitors have given way to incongruous stands of terrestrial plants. Montezuma’s waterfowl can’t be happy about the current conditions, as the masses of American Coots, Common Moorhens, and Pied-billed Grebes we usually observe have dwindled to mere stragglers. On the other hand, the swallows seem ecstatic. Literally thousands of Bank, Barn, and Tree Swallows crowd the lower elevations, skimming the surfaces of what small pools and channels remain and swarming the new vegetation. 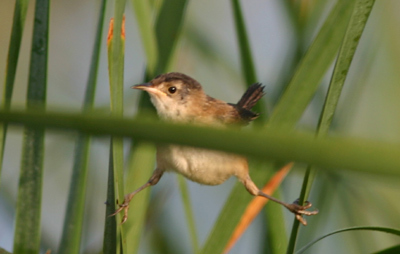 The Marsh Wrens must like these changes too, as I’ve never seen them so gregarious. Wrens perched on reeds right along the drive, cavorting with Swamp and Song Sparrows, as well as a group of yellow birds I initially had trouble identifying. Suddenly, Montezuma is attractive to grassland species like Bobolinks. Will wonders never cease? The Main Pool still serves hordes of herons (Great Blue and Green) and egrets (Great and Snowy) as well as Ring-billed Gulls and Red-winged Blackbirds. Bald Eagles we a no-show, but Osprey are apparently getting by. One prominent stand of willows, you know the one, held Yellow Warblers as well as Common Yellowthroats in enough plumage variations that I tried to turn them into different species from Yellow-breasted Chat to Nashville Warbler. Actually, I think I was right about the chat! Moving on to May’s Pool brought big-billed Caspian Terns, but no Black ones. We added Lesser Yellowlegs and some of the more common sandpipers and plovers to the day list, but nothing exceptional. When some of the local birders, members of the club from nearby Geneva, invited us to follow them to Towpath Road, the route to Knox-Marcellus Marsh, we jumped at the chance. It wasn’t until we arrived at our destination that we all realized that we’d met before; our hosts were none other than Bob and Leona, the exceedingly kind couple who delivered our New Year’s Day Trumpeter Swan! This remarkable coincidence didn’t produce much in the way of birds, but made our day nonetheless. Besides the Short-billed Dowitchers, Seth and I spied Indigo Bunting, Northern Harrier, and hundreds of butter-colored Bobolinks. We ended the excursion at Tschache Pool, which was short on shorebirds but long on ducks. Flashing scapulars allowed us to separate Blue- and Green-winged Teal in flight while size betrayed Mallards and Wood Ducks. All in all, the day was good, but not great by Montezuma standards. Missing the cranes just gives Seth and I more incentive to visit again soon. While we’re on the subject, the most interesting bird of my weekend came not in the Finger Lakes, but off the highway en route.Â We stopped briefly in the parking lot of the world-famous Roscoe Diner off Route 17 to let Mason and Ivy stretch their legs. While attempting to keep the kids from eating some unfamiliar species of wild grape, Sara picked out a bizarre bird overhead. At first, I thought she was talking about the Red-eyed Vireo peeking out from behind some leaves but then I beheld a beast of a bird bedecked in scarlet, saffron, olive, and ivory. This insane avian looked as if a blind man assaulted it with the full spectrum. Sara’s first thought was an escaped exotic. Fortunately, the field guide at hand revealed the oddity as a particulalry mangy Summer Tanager, probably female but possibly first spring male. Very cool. Still, Montezuma is an awesome place to bird, no matter what the season and it sounds like you had a good time, which is really whats important. Where Are You Birding This Final Weekend of 2017?